Ecopackers v Cusco, Peru: Zarezervujte nyní! 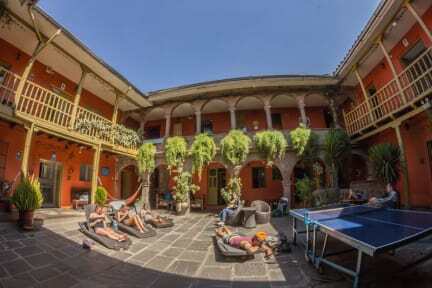 Ecopackers is an exclusive hang out for those who want the privilege of staying down town in a vintage house, in one of the first Casonas built by the Spanish settlers when they conquered the Inca Empire, nearly five hundred years ago. The hostel is ideal for those who enjoy the company and like to have fun with other young and responsible international travelers, in a clean, happy and secure environment. For those who, after a full day's outing, want to enjoy a friendly atmosphere, a hot shower in a spotless bathroom and to sleep in a comfortable bed dressed with linen of a five star hotel quality. This is the place for you. Ecopackers is an ecologically friendly establishment.